After my recent post on going natural with my beauty ritual, many of you asked for tips and tricks on all-natural beauty routines for different skin-types. So today, we are starting a brand new series dedicated to inspiring ladies who already made the swap and can't get enough of the amazing results. First up is Monica from hola! design. She recently moved from NYC to Miami Beach. She works as a web designer who also has a talent for snapping gorgeous photos :) She is super lovely and just looking at her pictures makes me want to jump on a plane to Florida! Finding a beauty routine that suits you takes a lot of trial and error. After trying countless of products (and spending a lot of money) I’ve finally found what works best for my sensitive and acne prone skin. Today, I’m happy to share with you my easy-but-effective skin care routine. The best part? It’s all natural and super affordable! After years of skepticism, I’ve finally jumped on the oil cleansing wagon. I use organic cold pressed hemp seed oil because it has a comedogenic level of 0, meaning it won’t clog your pores. In fact, hemp seed oil will reduce the size of the pores and eliminate blackheads and pimples. And, since it’s a green color, it reduces skin redness. Apply oil to your face and rub as regular cleanser. Wet a cotton cloth or square cotton pad with warm water and remove make up (if you wear a lot of makeup you may have to repeat this step). Rinse with lukewarm water and pat skin with towel to remove any excess oil. If your skin feels dry, you can also use hemp seed oil as a moisturizer. Green tea has a lot of anti-aging antioxidants and helps repairs the skin, while apple cider vinegar kills bacteria, unclogs pores and balances skin’s PH, among other benefits. The two together create a miracle toner that leaves the skin soft and brighter. Simply brew green tea and once it’s cooled add organic apple cider vinegar* (1 part apple cider vinegar, 2 parts green tea). Pour in a small bottle and keep it in the fridge for up to 2 weeks. Apply to clean skin with a cotton pad. Don’t use regular distilled vinegar, it’s very harsh on the skin. Rice flour helps prevent sun damage and wrinkles; Asian women have been using it for centuries! Honey is very nourishing and soothing on the skin, leaving it smooth and hydrated. Also, it’s antibacterial and anti-inflammatory so it works wonders on acne prone skin. These two ingredients, combined, make an amazing face mask. Put 2 tablespoons of rice flour in a bowl and add 2 tablespoons of honey. Mix until incorporated. You can add lemon juice, green tea, water, more honey or milk to make it smoother if it’s too thick. Apply to face in soft motions to exfoliate gently and leave it for 10-15 minutes. Rinse with lukewarm water. And that’s it! That’s my beauty routine. I've been following this regime for almost 3 months and the results have been wonderful. 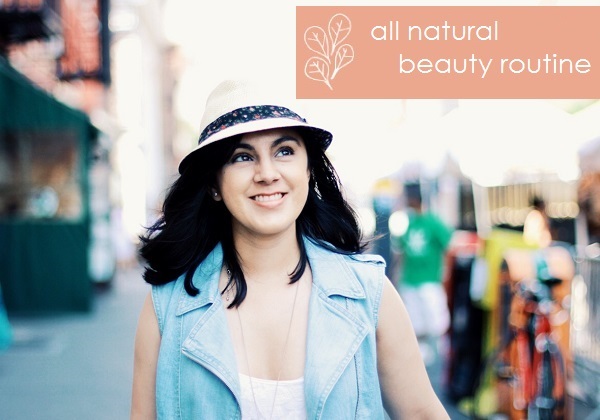 I encourage you to make your own beauty products and let your own natural beauty shine! P.P.S: And this all natural berry lippy. Katie, I tried the mask over the weekend and my skin feels amazing! Jillian, you will love it! Thank you for having me, Diana! and thank you ladies for the sweet comments!